That’s why Shining 3D recently launched a series of desktop 3D scanners that promise to make high resolution scanning available to everyone. ENGINEERING.com tested two models in the company’s EinScan series to see if they’re ready for prime time. The EinScan-SP and EinScan-SE white light scanners. 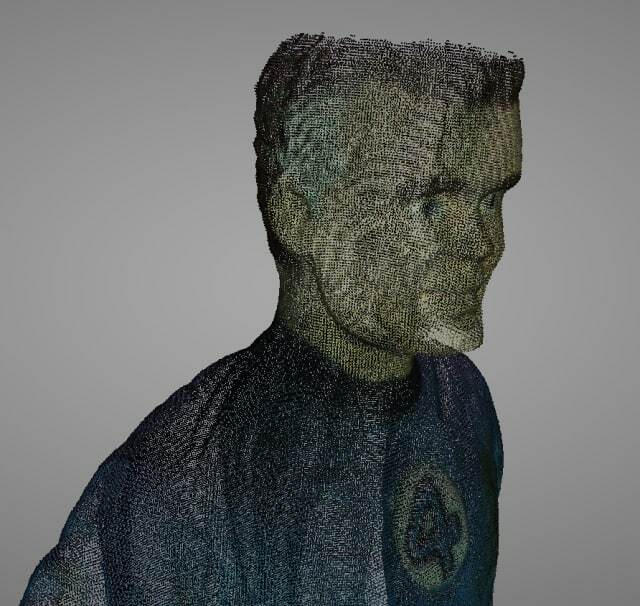 The EinScan uses structured white light to generate 3D models of objects. 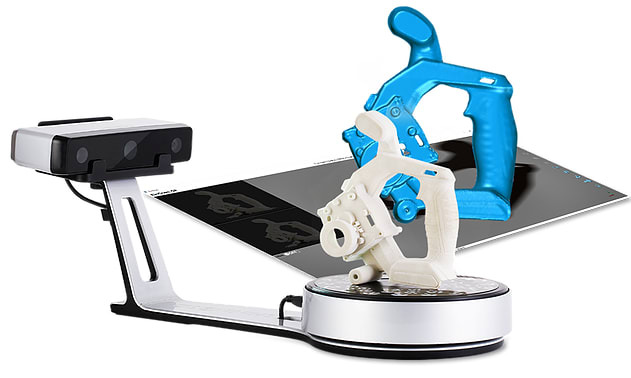 Shining 3D offers two versions of the scanner—the EinScan-SE (Elite) and the EinScan-SP (Platinum)—with different specifications designed for different applications. The EinScan-SE is the successor to Shining 3D’s EinScan-S, featuring a new design and upgraded capacity. It is designed for non-technical users, such as 3D printing hobbyists and others who embrace the “maker” label. Retail price for the SE scanner is $1,199 USD. The EinScan-SP is a higher-end offering, with greater accuracy, faster scanning speeds and a larger fixed scanning volume. It is designed for professionals working in the fields of reverse engineering, animation, archiving and heritage preservation, to name a few. The SP retails at $2,299. Whether you’re using the EinScan-SE or EinScan-SP, the box includes essentially everything you need to get started. Contents of the EinScan-SE box. Contents of the EinScan-SP box. Essential items not included in the boxes are the manual and scanner software, both of which are downloadable from the Shining 3D website. The hardware set up was straightforward: attaching the scanner head to the bracket and the bracket and turntable to the stand. On the software side, the installation program downloaded from the website is common to the EinScan S, SE and SP models, and includes an optional user experience improvement survey, along with the necessary drivers. The most notable difference between the EinScan-SE and EinScan-SP is that the SP includes a tripod and alignment markers, which come both on the turntable and as a separate pack of stickers. Both the tripod and the stickers are primarily for use with the fixed scanning mode. Although the EinScan-SE and EinScan-SP share many of the same specifications, there are some crucial differences that set them apart. First and foremost, the EinScan-SP is twice as accurate for single shots as the EinScan-SE at ≤0.05mm and ≤0.1mm, respectively. Another big difference lies in their maximum scanning volumes; both have a maximum auto scan volume of 200 × 200 × 200 mm but the SE has a maximum fixed scanning volume of 700 × 700 × 700 mm, compared to the SP’s 1,200 × 1200 × 1200mm. Scanning speed is the final major specification difference between the two models, with the SP operating at roughly twice the speed of the SE for both fixed scanning (<8s vs <4s per scan) and auto scanning (<1min vs <2min per full scan rotation). One other point that’s worth noting is that the two models have different system requirements: the SE requires >8 GB of RAM and >1 GB of video memory whereas the SP requires >16 GB of RAM and >2 GB of video memory. Loading the software for the first time first brings up the option to participate in Shining 3D’s user experience program. Once you’ve decided whether to opt in or out, you’ll be asked to choose your device: the EinScan S, SE or SP. From there, you can choose your scan mode: fixed (without the turntable), auto (with the turntable) or calibration. As this was our first time using the scanner, we selected the “Calibrate” option. 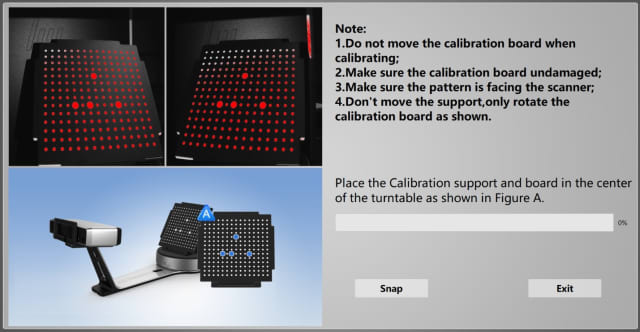 The software prompts you to place the calibration board on the scanner in its holder and scan it three times, adjusting the alignment of the calibration pattern each time. Both the software and the user manual stress that you should avoid moving the holder, which led us to recalibrate on the EinScan-SE after accidentally bumping the holder the first time we rotated the board. Once the calibration is completed, you’re returned to the scan mode starting page. Selecting the Auto Scan option prompted us to select an existing project or create a new one. 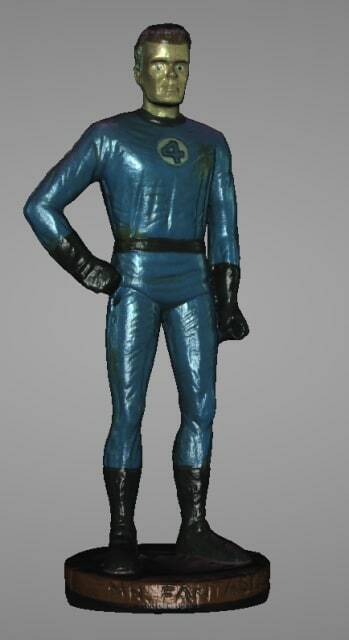 The next choice was between a texture scan and a non-texture scan (read: with or without color)—the manual recommends selecting the first option in order to enter the white balance test. This test is designed to improve scanning results when dealing with colored objects—it’s performed by placing a white piece of paper in front of the calibration board. Initial scan of Mr. Fantastic on the EinScan-SP. Once the white balance is set, you can select description that most closely matches the object you want to scan: “Bright,” “Medium,” “Dark” or “Bright & Dark.” You can also adjust the number of turntable steps, from a minimum of 8 to a maximum of 180. Increasing the number of steps improves accuracy at the cost of scanning speed, meaning that the speeds quoted in the specifications above are maximum values. Mr. Fantastic after Watertight mesh. Once you’ve completed a scan, the software gives you a few options for editing the data, including deleting selected areas and showing/hiding the texture display (in the case of a texture scan). There’s also a built-in mesh feature, which does some post-processing. It has two options: “Watertight” and “Unwatertight.” The former option is slower, but yields a closed model for immediate 3D printing. While the latter option doesn’t fill in any gaps from the scan, it is considerably faster. We also tried out the fixed scanning mode on the EinScan-SP. If you’ve been using the scanner already, the option to run calibration is there, but it isn’t required before you can start scanning. Not being required to recalibrate for every new scan or project is convenient, but you should do so if the scanner has been moved or the lighting conditions have significantly changed. Preparing to scan uses the same steps for fixed scanning as for auto scanning: choosing texture or non-texture and the relative brightness of the object. 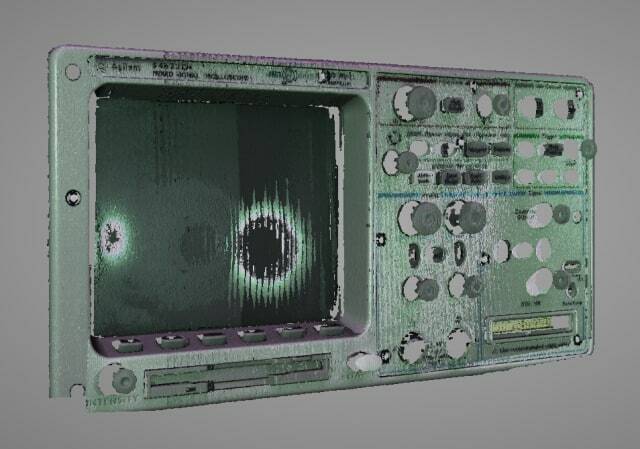 Front panel of an oscilloscope scanned with the EinScan-SP. However, unlike the auto scanning option, fixed scanning requires you to manually move either the object or the scanner between scans. The user’s guide recommends maintaining at least a 1/3 overlap on each change of position, which helps maintain alignment between scans. The white-dot alignment markers included with the SP can also help, especially with alignment on uniform objects. When we finished scanning, the same options were available as with the auto scanning mode: deleting unwanted portions of the object and basic post-processing. So, how does the EinScan-SE stack up against the EinScan-SP? 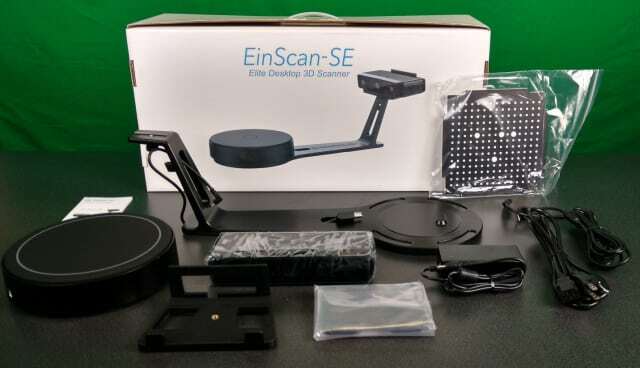 The EinScan-SE is a solid entry for serious hobbyists and makers who want fast and detailed scans at an affordable price point for this user segment. While the SE does have the lower scan speed at approximately half the speed of the EinScan-SP, it still only takes around two minutes for an auto scan with the minimum number of steps (in this case, we used the software default of 8). 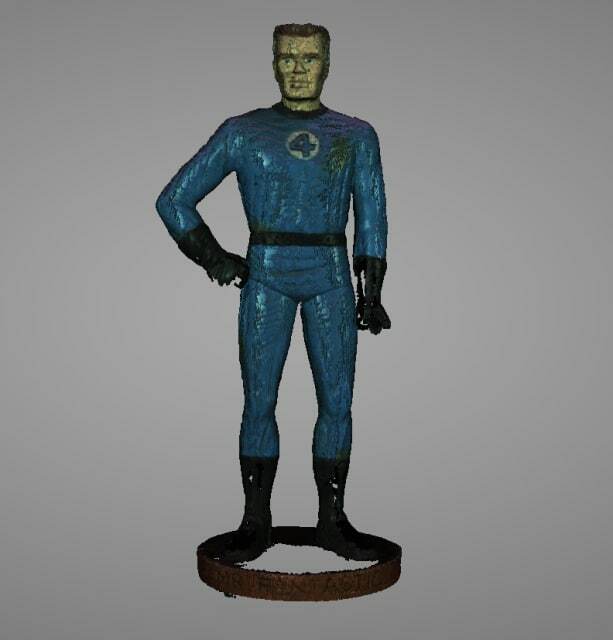 Even running multiple scans to refine a 3D model, users will be able to complete a scan project in fairly short order. Close up of Mr. Fantastic scanned with the EinScan-SE showing points. The smaller scan area of the SE could be tricky to work around for users who occasionally need larger scans, but for the relaxed-spec professional and advanced hobbyist group, the SE’s maximum scan area is likely to be sufficient for most projects. This is where the SP could be worth the additional cost, especially for professionals who regularly need larger scans and would prefer doing it all in one shot, rather than having to edit together multiple scans after the fact. Of course, where the EinScan-SP really wins out is in the higher accuracy that you get over the SE. For professional projects, this would be a significant draw, since you can get a high-quality scan ready for 3D printing or importing into CAD software on the first pass, depending on the complexity of the object. In our testing, we included scans by personnel with no prior experience in scanning, CAD or 3D printing, a tough test of simplicity-of-operation. It’s worth noting that our non-professional users did find the software a bit less than intuitive in some respects. Switching scan modes required the user to return to the top-level Home screen to select a different scan mode, and then required navigating back through the initial scan set-up steps. 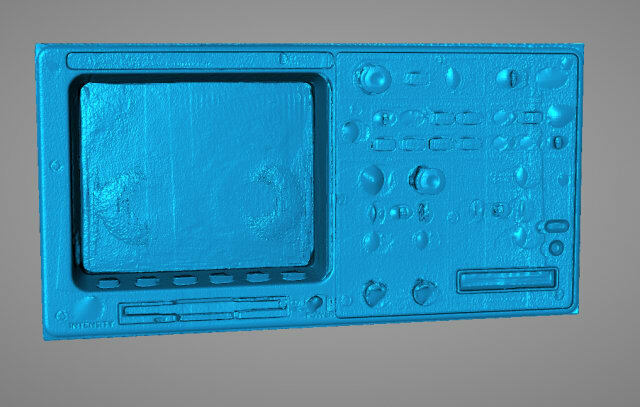 Front panel of an oscilloscope scanned with the EinScan-SP after adding watertight mesh. Being able to switch scan modes or scan attributes within a project would save some time and feel more efficient, but in the end, it isn’t a deal-breaking inconvenience. Other than this, the software was easy to work with and straightforward to understand. We expect that professional engineering and design users will find either EinScan model easy to set up and use. It’s also worth noting that the systems operate with computer platforms running Windows operating systems. Mac operating system will be supported in next update, estimated to be released before September 2017. The verdict: if you want something fun and easy to work with for less critical applications, the SE is a good value for the capabilities it offers. But if you need higher quality output, faster speeds or a larger scanning volume for technical or professional production applications, the greater detail, accuracy and scan speeds could be worth the SP’s higher price tag. Both the EinScan SE and SP represent excellent value for money and can open new possibilities for part design and reverse engineering. 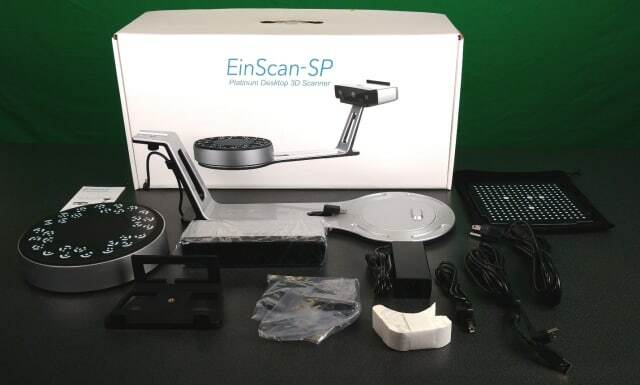 Want to learn more about the EinScan-SE and EinScan-SP 3D scanners? Check out the Shining 3D website.